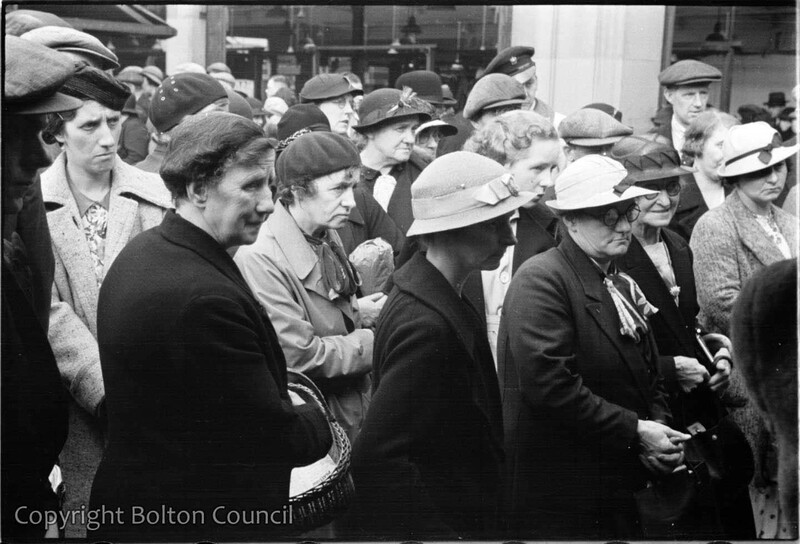 Customers at a quack medicine stall in Bolton’s open market, Thursday 23rd September 1937. Before the NHS was established working people in Britain would rely on such stalls and shops as visiting a doctor was expensive. The rather stern looking lady wearing the beret, just left of centre, is my Grandmother, Margaret Elizabeth Sanders (formerly Swan)dob 20/03/1886, Toxteth Liverpool. The girl with the wavy hair, two to the right, is my mother Sylvia Elizabeth Sanders, aged 16, dob 06/05/1921, from Bolton. You may already know this as I told the archivist five years ago.